Click here for advertising info! View the most recent edition! 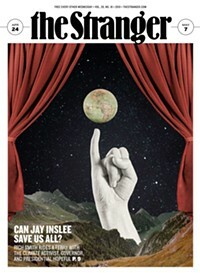 The Stranger's quarterly magazine, Seattle Art and Performance, is the largest circulated arts publication in the Northwest and is THE definitive guide to the Seattle arts season. The deadline for the Summer 2019 issue (covering June 10–Sept 15) is April 24. The deadline for the Fall 2019 issue (covering Sept 16–Dec 8) is July 31. The deadline for the Winter 2019 issue (covering Dec 9–March 2020) is Oct 23.